The Whitetip Reef Shark's scientific name is Triaenodon obesus. It is a species of requiem shark, family Carcharhinidae, andis the only member of its genus. Unlike most other requiem sharks, the whitetip does not have to keep moving in order to pump water through its gills. Because of this they usually spend the day in shelters or caves waiting to hunt for food during the night. Although some reports say this shark can reach up to 2.1 meters (6.9 ft.) it is probably more likely that they reach about 1.6 m (5.2 ft). Even so, the size of this shark puts it out reach of normal aquarists. They can often be seen in larger public aquariums. The whitetip reef shark can be found in the entire Indo-Pacific region as well as the Red Sea. Whitetip reef sharks are only aggressive towards humans on rare occasions, though they are curious and may investigate swimmers closely. The Bluewspotted Ribbontail Ray, as it is also called, will grow a total of 28" including the tail! The body will grow to just under 12" and this ray will need a tank that is beyond most aquarists reach. A tank that is over 300 gallons is needed to help them feel comfortable, along with a sandy bottom and only a ledge to take refuge under. Use water that has no traces of copper or other contaminants that are typically found in tap water. Use reverse osmosis or deionized water. They are difficult to feed, and need live shrimp or marine worms to get them to start. This is for an advanced aquarist. The tail's spine can inflict a painful wound. This stingray scored itself a yummy meal! The California Stingray, like other stingrays need a very large tank with a sandy bottom void of rocks and obstruction. They can become quite tame in captivity, however they need a tank that is at least 280 gallons to accommodate their 9" body and even longer tail! They need cooler tanks with temperatures from 54 to 72˚F for long term survival. Cat Sharks will reach over 18 feet, thus needing a crazy huge tank! If you have a tank that is about 1,000 gallons or a pond in the back yard, this shark is easy to keep. Want a shark that won't eat the cat that it is named after? There is the Bamboo Shark which is from the same family, but only grows a little over 3 feet. That is still huge, but not as daunting as the Cat Shark. Their barbels look like whiskers of a cat, thus earning them this name. Not the monster we always think of! This video is just a beautiful example of how proper posturing and touch will allow interaction with a Great White Shark. (not our title, just copied) These large fish often ignore humans, unless they are feeding and are "sampling" the weird person-fish out of curiosity. Great Whites often bite surfers near where sea lions live, mistaking them for prey, however the sharks do not pursue and eat a human since they don't like how we taste. In a calm setting, a Great White can be interacted with if a person is calm, trained and it is NOT the shark's feeding time! This adult is about 3 feet long, requiring a tank that is 300 gallons or more. They get along with any fish that they cannot swallow. Provide open space with a sandy bottom and a little bit of rock work with caves that have smooth edges, so they do not scrape themselves. They need cooler waters in the lower 70's and require 30% to 50% water changes every week due to their messy way of eating. They are actually easy to feed and will do well in a tank with a strong skimmer, a good sump to hold lots of live rock for filtration and clean water. Do not house with large angelfish that mistake their eyes for the LPS they eat, nor with aggressive fish that pick on these very still sharks. This video shows the habitat these little juveniles prefer off the coast of La Jolla shores in California. These babies are not much bigger than an adult hand. The Horned Shark is actually easy to care for, however the tank should be 300 gallons and the water needs to be kept clean. The name comes from 2 horns on their back, one behind each of the dorsal fins. They are more brown as babies and their tank should have a soft sandy bed and smoothed out hiding places in rock or fake smooth caves or structures. The sump will contain the large amount of live rock you will need for good bacteria and filtration. Sharks and Rays can both be fun additions to an aquarium that is large enough to suit the particular species (minimum size 180 gallons for the smaller or less active species), and that provides the right environment. The Sharks and Rays belong to a subclass of animals called elasmobranchs. As noted by Scott W. Michael in his book, "Aquarium Sharks and Rays", they are further divided into superorders, the Squalomorphii (sharks) and the Rajomorphii (rays). The differences between these two is slight and rays are essentially "flattened sharks". Sharks and rays should be kept by advanced marine aquarists and each species will vary in ease or difficulty to keep. Some are quite hardy in a regular marine system while others have very specific requirements. See an overview of sharks and rays below, and visit each fish for its particular needs. Most Sharks and Rays are large meat eaters that require large aquariums. Most grow to a minimum of 36 inches and require a minimum 180 gallon aquarium. 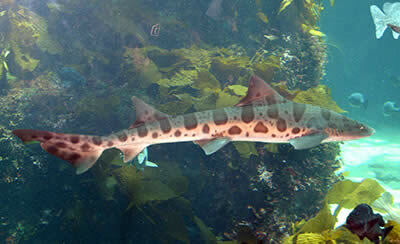 Many sharks, like the leopard shark, shown above, can grow up to 6.5 ft. long and require a minimum 400 gallon tank. You would think that the adult size of these fish would keep them out of the general aquarium hobby industry, but young, small sharks are still offered for sale to people who may not realize how big they can get. Some sharks that we have seen offered for sale but should be avoided because of their size are the Black Tip Reef Shark, Carcharhinus melanopterus (6 ft.), the Nurse Shark, Ginglymostoma cirratum (14 ft.), and the Cat Shark, Chiloscyllium confusum (7.2 ft). Blue Spotted Stingray, Taeniura lymma: 25 cm (10") without the tail. Sharks are aggressive carnivorous predators that will eat anything that they can swallow whole. Usually though they will not attack healthy, normal acting fish but will be attracted by the smell of blood or raw meat. They will also sense fish that are acting abnormally, like goldfish in saltwater, and try to catch them. Some sharks are constantly moving and searching for food, like the Leopard Shark found on the West Coast of the USA T. semifasciatus, while others, like the Leopard shark found in the Coral Sea, S. fasciatum, lie around waiting for food to come to them. All sharks swim by moving their vertically oriented tail fin from side to side. In contrast, porpoise and dolphin have a horizontally oriented caudal fin which they move up and down. Most sharks are rather large and not well suited to life in captivity. Most rays have a flattened body and are bottom-dwellers. This body shape enables them to better blend into their environment, and to bury themselves in a sandy substrate. In many species, this flattened body enables them to stay afloat with very little effort. Most rays swim by "flapping" their enlarged pectoral fins like wings, and those with a well developed caudal fin swim similar to the shark. Should be fed all kinds of meaty foods, live or prepared. Fish, squid, shrimp, occasional live goldfish. Will eat most anything they can swallow in one bite.